Michael Garaway is a British artist and educator living in Berkshire, UK. He makes drawings, paintings, digital and mixed media art inspired by urban landscapes and technologies. Much of his recent work responds to specific sites in and around Reading. His interests include geometrical composition, surfaces, tone and colour, and the relationship between physical and digital art forms. He has strong digital skills, and the disciplines of observation, drawing and colour also underpin his work. 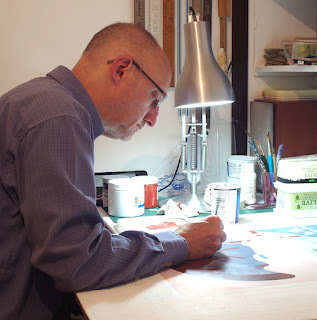 Michael studied Fine Art at Manchester Polytechnic and University College Chester, and has exhibited since the 1980’s. He has also worked as a graphic artist, as a technician in education, and in lecturing, course leadership and external examining positions in higher education, currently a visiting lecturer at Regents University London. He is a member of the Reading Guild of Artists, and Commission4Mission.